When starting to learn Celtic work, using graph paper makes life a lot easier. However, with a bit more experience and a very steady hand, any good quality paper is fine. For pens, anything is fine, though in a very small or very detailed picture, a thin marker pen of the “Rotring” type is best – I use a 0.25mm ink-pen for my work. 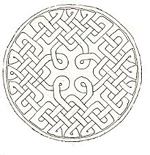 There are a number of construction methods on the internet and in books for Celtic knotwork. Some are very formal (e.g. Aidan Meehan’s methods) and some more fluid and informal. I’m going to use a relatively informal version here, but for those who have used Aidan Meehan’s methods, I’ve put some of his terminology in brackets where possible. 1. Start by placing equal-spaced dots on your graph paper (equivalent to Meehan’s primary grid). Leave about 2-3cm between them for this first try – enough room for another set of dots to be added. 2. Put smaller dots half way between the first set of dots – both horizontally and vertically (these are equivalent to Meehan’s secondary grid). Each of these small dots is going to be where two “cords” cross over each other. 3. Put a double lined “X” over the middle of each small dot (left side of next picture). The thickness of the X will determine the thickness of the cords. 4. Continue putting “X’s” over all the dots within the grid – though don’t put “X’s” over the dots that fall right on the border of the grid. The “X’s” should meet each other on the diagonal (right side of picture). 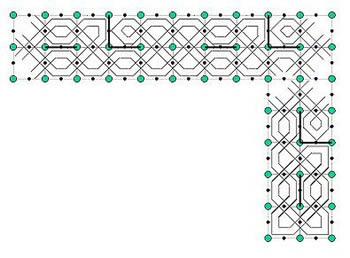 An easier method, when you are used to these construction principles, is simply to draw one line on each side of each row of dots (right side of picture). However, you need to make sure that the distance between the two lines is consistent over the whole grid. (These crosses are the equivalent of Meehan’s tertiary grid). 5. When you have “X’s” over all the small dots, and all the diagonals have joined up within the grid, you need to join up the cords at the border. So take each cord in turn and “bounce” it off the border – it should come back at 90 degrees to the original, and then it will join up with another cord. For the corners, you can join the cords together in a rounded style, or a pointed style – or whatever style you want! 6. Now you need to interweave the cords. Take one point of the grid as a starting point – it’s usually easier to take a corner than some point in the middle. Each cord must be made to interweave with the others – first it goes over the other cord, then under, then over, then under etc. To make the weaving, either emphasis those bits of the “X” lines which are going over, or rub out the its of the “X” lines that are going under. Take one cord to start with, and follow its weaving around the knot. If you have more than 1 cord in your plait, there will be a point when you have interwoven all the first plait, and there will still be some “X’s” left unwoven – these are from different cords. Choose another starting point and weave the rest of the “X’s”. An animated graphic showing a very similar creation process can be found here. This basic knot can be changed to fit any size or shape – from a small knot (which uses a 2×2 primary grid) to a whole border – simply by changing the size of the starting grid. Modifying the basic knot to create loads of different knots is easy. “Walls” in the grid are used to deflect cords into different patterns from the design we created above. 1. 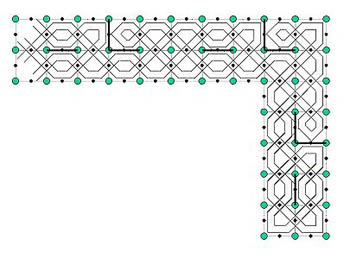 Start using the same grid as for the basic plait – graph paper with dots and smaller dots placed in between them. 2. Then place walls between any two of the bigger dots. These can be put anywhere as long as they are only placed horizontally and vertically. In this example, 4 walls are placed coming in from the edges. However, walls can also be put in combination – you can line them up several across, or partner them up into “T” or “L” shapes, or add several together to make many more complex shapes. 3. Start marking “X’s” over the dots – except where the “X’s” would intersect with the walls. 4. When all the “X’s” have been filled in, start adding caps to the corners of the knot and edges where necessary. 5. Interweave the cords. Follow the whole length of one cord, then work on the others. An animated graphic showing a very similar process can be found here. Another (more complicated) example of constructing plaits with walls is shown below. 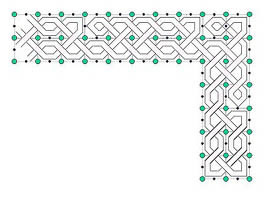 It’s all very well to be able to make the square-ish-looking knot from the first article, but to be able to use Celtic knotwork in your own artwork, you need to be able to take a basic knot “unit” and multiply it – either to form a border, or to fill a space on a page. Multiplication of a “unit” can be done in two main ways – horizontally and vertically, though the principle is exactly the same. Here, I’m going to take a knot I’ve just created, and turn it into a border. You’ve created a wonderful knot … and you want to use it as a border unit. What could possibly go wrong?? Well, hopefully not a lot, but the size of the knot may not be suitable for the size of the border. You can’t create a good pattern when your knot unit fits 5¼ times into the length of paper that you want your border to fit on.